Sweet and tart cherry bars with crispy butter crust. 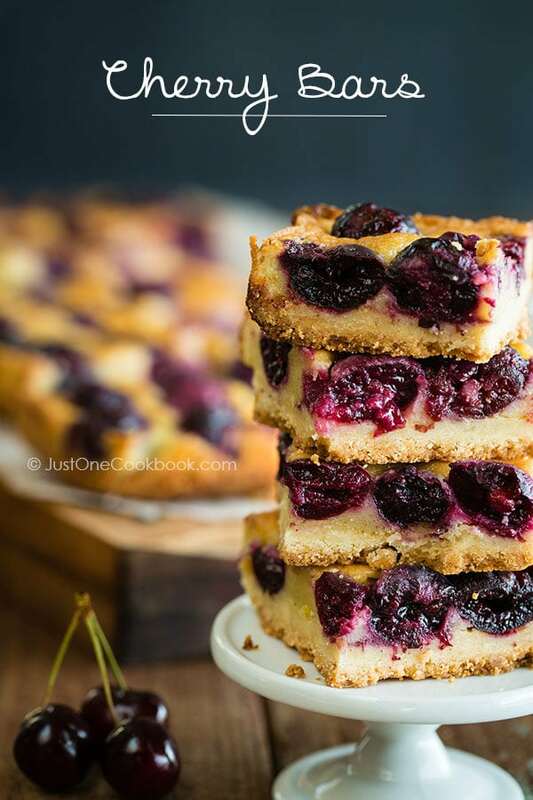 Made with fresh cherries drizzled in a savory custard, these delicious bars are as glorious as the summer sun. 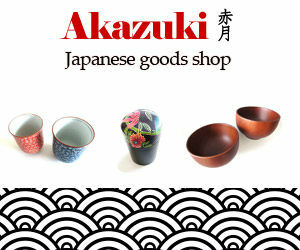 Enjoy while the fresh cherries are in season! I love it when summer arrives; besides the warmer weather it’s also cheery season! My family have been going cherry picking with our friends and their children (five families!) for the past several years. With the fresh cherries we picked, I’ve made Cherry Clafoutis and Cherry Ice Cream in the past, and this year I made these really delicious Cherry Bars. 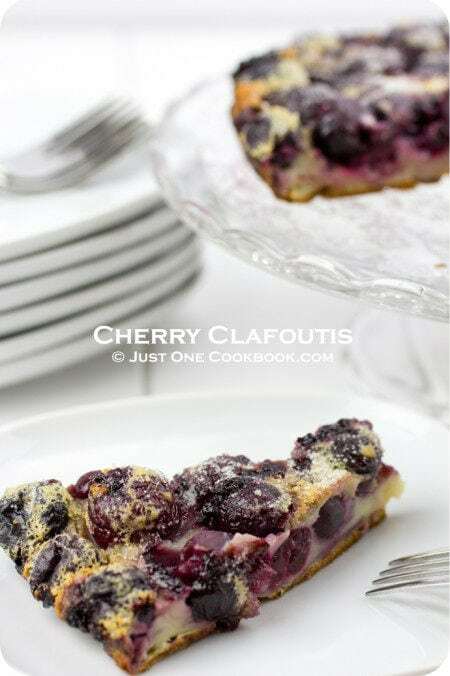 My friend Laura of Tutti Dolci recently shared her delicious looking cherry bar recipe, and I knew right away that’s the first cherry dessert I was going to make this year. What makes these cherry bars extra delicious? Brown butter. Ever since I made the Nutella Stuffed Brown Butter Chocolate Chip Cookies with Sea Salt, my family is hooked on brown butter. It’s a magical ingredient for us. The smell of cooking brown butter makes my house smell like a cookie factory and the kids just want to hang around the kitchen waiting to see what delicious dessert I am making. In case you are not sure what brown butter is (don’t worry I didn’t know about it until very recently), it’s not something you “buy”. It’s basically melted butter you can easily whip up at home. 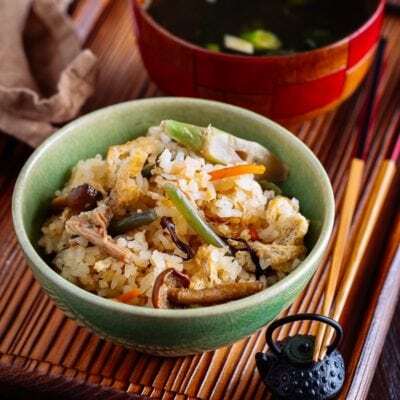 It is one of those secret ingredients that can enhance the flavor of just about anything! It’s rich, nutty and incredibly fragrant. I added a video clip at the end of the recipe to show you how you can make brown butter by cooking unsalted butter in a pan. The result of the cherry bars was absolutely stunning that my family is already asking me to make these bars again! They were a big hit with my neighbor and my husband’s coworkers too. On a side note, can you tell that I really enjoyed taking pictures of these bars? I make savory dishes for the blog most of the time and I have to move swiftly when taking pictures of them. There is very little time to play around. But these bars can tolerate a long photo shoot session. And the best part of sharing dessert recipes? I can make them at night time when the kids are asleep and photo shoot the following day (if I can control my desire to eat right out of the oven). 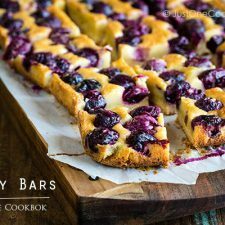 I hope you enjoy seeing some dessert recipes from time to time, and try making these cherry bars especially when they are in season. They are sooooo good! 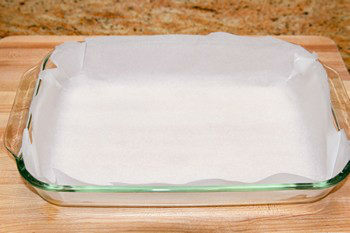 Preheat oven to 375F and line a 13 x 9-inch baking dish with parchment paper. Pit cherries and toss them with 2 tsp. flour. In the bowl of an electric mixer, combine melted butter, vanilla and sugar. Mix on medium speed until well blended and smooth. Blend in flour and salt and stir until incorporated. Press dough evenly into bottom of prepared baking dish. Bake until crust is golden and slightly puffed, about 18 minutes. When the crust is done, transfer to a wire rack and cool crust in pan. Meanwhile, let’s make the filling. 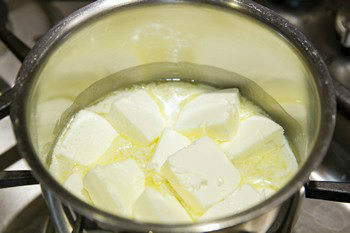 Cut the butter into a few pieces and place in a saucepan over medium heat. Melt the butter completely stirring frequently with the spatula. As the butter heats, it will begin to foam and then bubble. After several minutes, the milk solids will start to become brown on the bottom of the pan. Make sure that milk solids do not stick to the pan. Continue stirring until the butter is evenly browned, being careful not to burn. Remove from the heat and pour browned butter into a glass bowl to cool slightly. 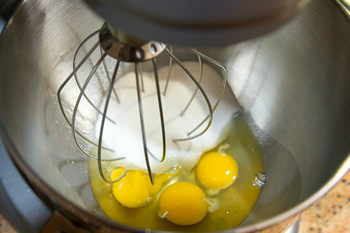 In the bowl of an electric mixer, combine eggs, sugar, and salt in a medium bowl and whisk all together. Add extracts and blend in flour by 1/3 at a time. Whisk all together until smooth. Gradually blend in browned butter and whisk mixture until completely blended. Arrange cherries over cooled crust. Carefully pour filling evenly over fruit. Bake for about 30 minutes, until filling is puffed and golden. A skewer inserted in the center should come out clean. Cool bars completely in pan on a wire rack. 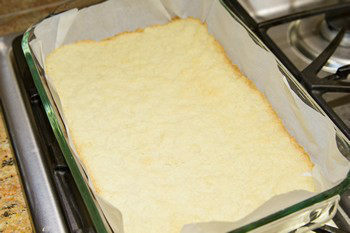 Carefully lift parchment paper to remove cooled bars from pan and place them on a cutting board. Cut them into squares using a knife. Store bars in an airtight container up to one day at room temperature, then store any remaining in the refrigerator. Metric conversion is from this site. ReMetric conversion is from this site.cipe barely adapted from Tutti Dolci, originally from Smitten Kitchen. Oh my goodness, that looks sensational Nami! I would love to have some with my coffee. YUM! Will be putting this on my to-bake list. Pinning! You have cherry trees in your backyard! 😀 So jealous! I’d be making these bars every week! 🙂 Hope you enjoy! 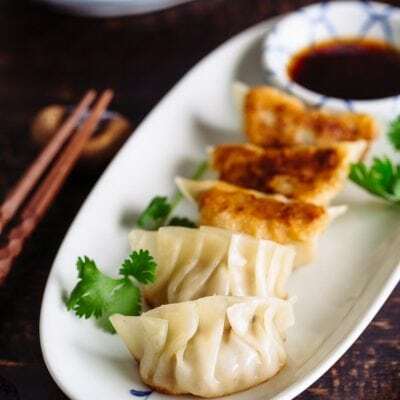 These look absolutely divine, Nami! Such a great summer dessert and perfect for the 4th of July! Gorgeous photos, Nami! Now I’m craving these again :). So glad you liked them! These cherry bars sure look better than any store bought ones. Your kids and family are very lucky!! I’ve never made this before but it looks wonderful. I’m saving this recipe to mak and you said you weren’t a baker. This is absolutely wonderful Nami. I just love anything cherry and this recipe is so amazing. G’day Nami! 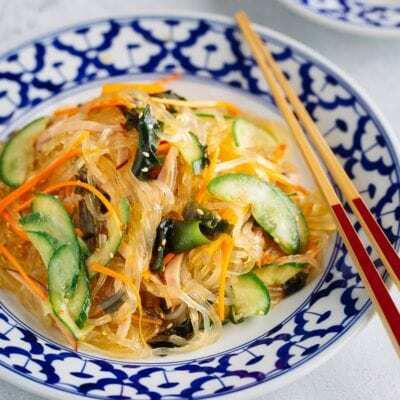 Love your photos and your recipe! These might have to go on the list to do for me! Nami, these bars look so good that I created a new board for it on Pinterest and pinned it! They look incredible. I just got some cherries today, so will try to save some of them to try this dessert. I will love to do all my pictures with day light. Your cherry bars shout homey goodness and comfort. Yet they are gourmet gorgeous. Wow, this is so delicious. Just love how pretty the cherries are on top. Reminds me of blueberries too. I think blueberries would work too? I love cherries but never cooked with them. The cherry bars look fantastic. What gorgeous bars! I really need to make these as well. I bookmarked them when Laura published them but I completely forgot about them until now! And recipes that allow us for longer photo shoots are the best! 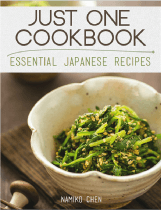 I definitely try to lean more towards those kinds of recipes. Woooooo, Nami baked again! And what a batch! Nami, delicious summertime treat – cherries are my very favorite fruits of all times and they have just arrived (from Italy) in stores . no local ones yet as the weather has been quite dreadful around here for quite some time – I am happy to read (and see) that you enjoyed your “sweet” picture taking – the photos look gorgeous! The cherry bars look so good. I can’t wait to try the recipe. On a side note, the second picture has a mistake in it. Ahhh! I made a mistake on TWO pictures this post. Working late at night is very dangerous… Thank you for catching a mistake and letting me know, Kat! After looking at these brown butter cherry bars you can’t say you don’t bake well. What a beautiful tray of goodness! 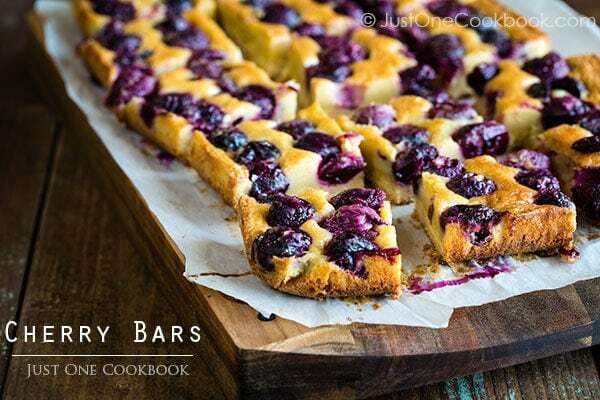 These cherry bars look amazing! 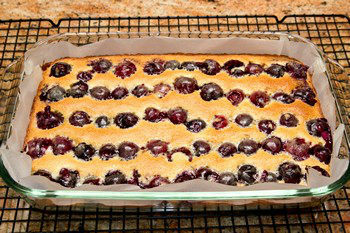 Love cherries and these bars are such a great way to use up the big baskets we get whenever we go cherry picking. Perfect summer treat! Nami, I am going to eat up your photos. Beautiful! AND DROOL!! These bars look incredible! What is the white thing that you add in the egg mixture under step 10? Thanks a lot. It was there on your recipe but somehow I missed it. Definitely will give it a try. Thanks a lot for all great recipe. I really enjoy reading your blog. I’d like one, please. Or more – many more! These look terrific. And we have a bunch of cherries int he refrigerator at the moment. May have to convince Mrs K R to do some baking today! Good stuff – thanks. These are such beautiful bars, Nami! I hardly ever bake with cherries in the summer because I end up eating them all first (haha), but I should definitely get some more and give these bars a try. 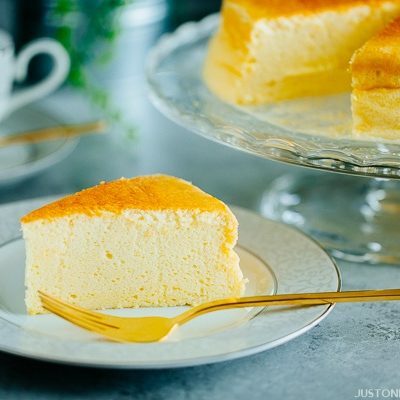 Great recipe and beautiful photos! Thanks for sharing. 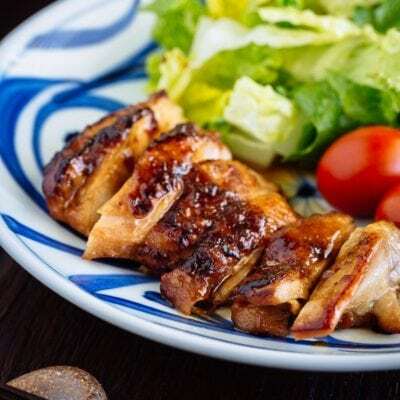 Hi Nami as always your recipes are very delicious, easy and awe aspiring to make. If you have a recipe for caramel bars since I cannot find one that is easy to make should be the same technique as these cherry bars. Have a nice day Nami..
Hi Tina! Thank you for your kind comment. I don’t have a caramel bar recipe but if I find it looks good I’ll sure give it a try! Have a nice weekend Tina! Absolutely gorgeous! Great clicks too. I’ve invested in one of those cherry pitters, Nami, and I STILL manage to get cherry juice up the walls, on the curtains etc! I am droooooooooling over those gorgeous cherry bars. Summer has arrived! I have been eating cherries a lot lately. I should try your dessert. I am sure I would like it a lot. These bars look heavenly! Would I be piggy if I ate the whole thing in one go…. Incredible, Nami. Yes, you should photograph desserts more often, you do it temptingly well! These bars look stunning! Beautiful color! I know what you mean about the fun of photographing sweet instead of savory dishes. It’s nice to be able to take your time instead of worrying that the food will get cold or if there are veggies, wilt. I LOVE that top picture, can’t stop looking at it. I rarely bake and take pictures of sweets, so it was actually fun that I had some time to work with the food styling and setting up the camera. 🙂 Thanks for your kind compliment! So glad you guys enjoyed the ice cream. Yes, double batch is a must. 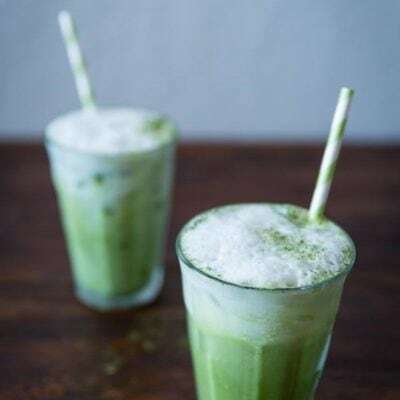 🙂 I love that matcha ice cream… Have a nice day! These look incredible! I’m so happy to see cherries coming back into season, can’t wait to try it. I don’t usually make desserts but I love looking at them and wish I had them 🙂 These look delicious. Pinned this.. this looks sooo delicious and beautiful! Thank Nami! 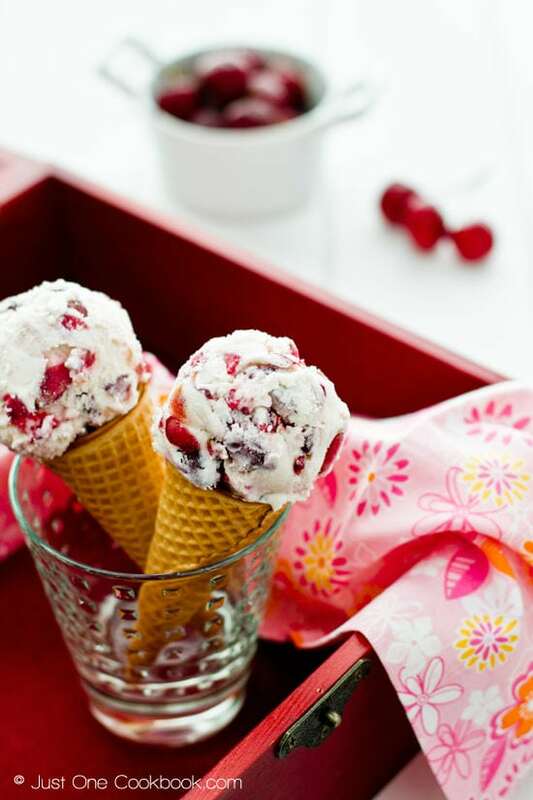 I love cherries and like your idea to have every season a new cherry recipe. Nami, you did outstanding job on the pictures, I LOVE them! 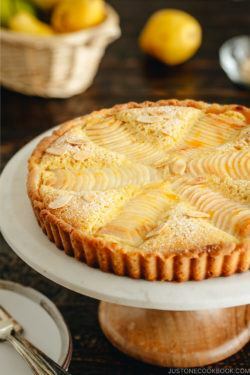 So pretty and tempting and I wish to have few pieces now with my tea. Perfection!!!!! That looks so good Nami, I am so envious of the fresh large cherries that you have in abundance now! They are pretty hard to come by here and even if they are available, they are too expensive! Ahh! Cherry and brown butter are such great combinations! Nami, I am raising my hand for these bars. So can I have a couple? Wow Nami, these cherry bars look fabulous…love the various layers of this bars. Beautiful pictures as always. Oh dear me! 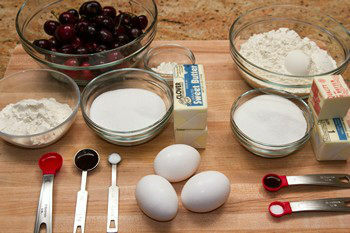 I need to get some cherries so I can bake this! Looks absolutely amazing!!! You are right, sweets are much more easier to photograph them than savory dishes! Your bars are amazing! It looks super delicious! I wish I was your neighbour. 🙂 Definitely being able to take a photo whenever you want is a huge bonus! Nami, these bars look fabulous, so enticing and inviting to bite in! Nami, I love the photos of these bars! I can well see you have had a pleasure to take them (even though all your photos look perfect). I also hate being in a hurry and appreciate dishes that can be reheated (stews) or desserts. I use brown butter (called in France “hazelnut butter” because of the aroma you mention) in Financiers (soft almond cakes I posted some time ago) and frankly it does change the taste, so I’m sure it works miracles here. 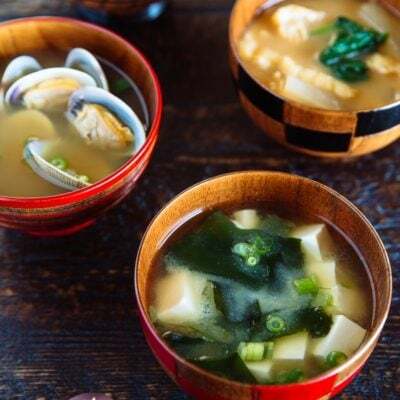 We have been having such a cold spring, all the fruits and vegetables are late (I almost feel as if I lived in Northern Canada! ), so cherries have only started to appear and are not at their best, but as soon as they are sweet and juicy, I will remember your bars. 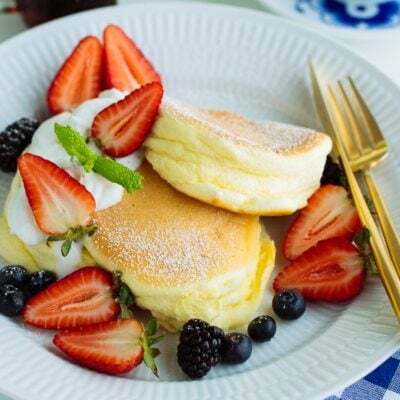 Now this is a recipe that comes from my world:) Very beautiful.. love your gorgeous photos.. very tempting images indeed. Seems that you have no more fears of baking, that is great. Hi Nami! Since we’re both residents of the bay area, I was wondering if you have a recommendation where to go cherry picking. I haven’t gone since I was a small child and would love do it again. Thanks! We go to Brentwood area, and tried Nunn Better Farms, Pease Ranch and other places (sorry I don’t remember names). Oh, and of course, delicious looking bars! Nami, I love all your photos and these cherry bars look fantastic. I do miss Michigan cherries. When I was a kid we would come home from camping up north or from a week at church camp and we’d always stop at a roadside stand and pick up some black sweet cherries. we would all eat them all the way home spitting the pits out the windows 🙂 and to think I was excited to find dried cherries here in Florida at Costco. 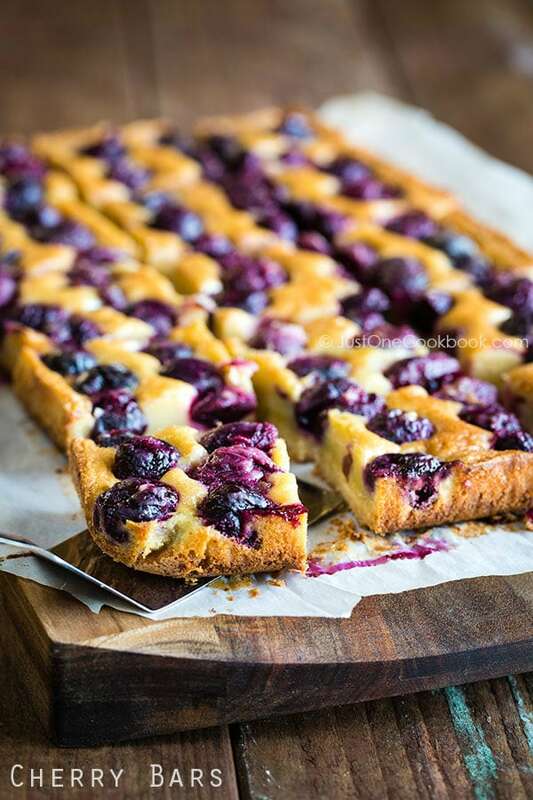 Positively delicious – it looks a bit like a giant clafoutis too… did you ever make one of those? 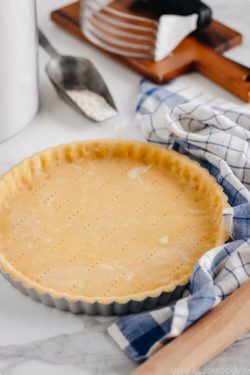 I never tried making brown butter, but I always buy salted butter and that never seems to go “nutty and brown”… it seems to go straight from golden to “burnt” :p.
These look scrumptious! I saw your pic on Instagram when you were waiting for it to cool off. The close up shots are gorgeous! Hope to try this one day. Hi Donna! If you saw the instagram (right after baked), you can tell what iphone with indoor light, and good DSLR with natural light (and edit) can do to the same bars… LOL! I hope you will try this. SUPER delicious! What great pops of color from the cherries! Each one of these bars look so pretty with the cherries, no wonder no one can resist them. The cherry bars look delicious. I haven’t had cherries (yet) this year – this looks like a great recipe to start off the (my?) season! Gorgeous photos too. Thanks Joyti! Hope all is well with you. 🙂 I have to enjoy cherries as much as I can! You certainly did have fun taking pictures and they turned out great! Certainly make me want to jump up and make these cherry bars. 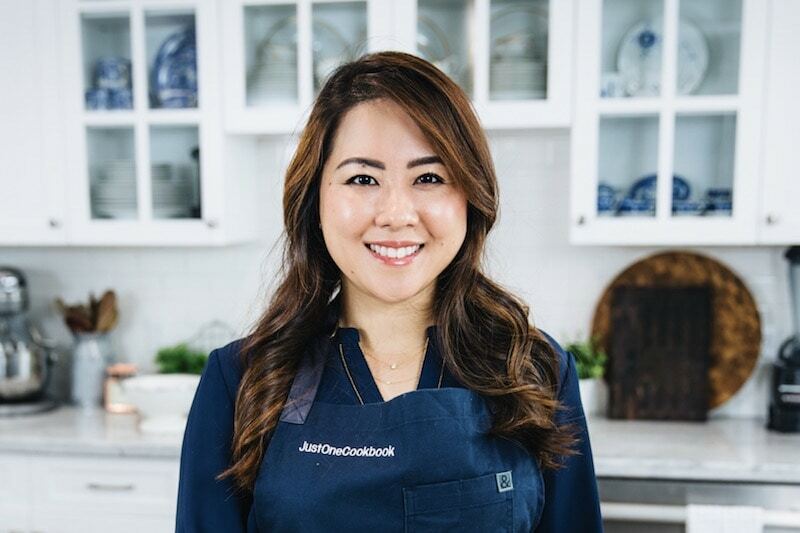 I agree with you on the brown butter – its flavor is unique and works as a great complement for SO many dishes. I bet it’s a great complement to these cherries. Great dessert! And YES – I love seeing desserts here from time to time! These cherry bars turned out just beautiful, Nami!! The cherries look like jewels! There are a zillion reasons why I love summer and cherries are definitely one of those. The bar came out so neat and I am sure it tasted amazing. I have to soon go for cherry picking. How fun you went cherry picking again! I’ve gotta find out if there’s anywhere in my area that I can take the kids to have some fun. I agree with you about taking more time to photograph desserts. I guess you now see why I have more desserts recipes on my blog than savory ones. 😛 When it comes to dinner time, the kids (and mostly hubby) can’t wait. hehe….it’ll be a torture for them to look at the food, hungry, but can’t eat yet. 😛 These cherry bars sure look amazing. 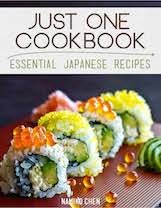 I can’t wait to make some for my family. I am simply drooling!! One of the absolute best things you can make with cherries! Cherry bars! Oh they are one of my favorites- hands down. Amazing and simply beautiful. I love the rustic feel to them with the juices oozing out! YUMMM! The bars look very very good. They would go so well with on July 4th!! Hi Nami! I stumbled upon your blog this morning and I’m so glad I did. I am literally squealing with delight right now!!! I cannot wait to try so many of your recipes! The illustrations that accompany your instructions are very helpful (as I am a bit of a novice, haha). I am so excited to share your blog with my family as well! Thank you for all your hard work, you absolutely made my day and I’m sure many more days ahead as well! Cherries are popping up all over the internet…I think everyone loves them. Your bars look delicious. O Nami, your cherry bars look amazing, so moist! Cherry desserts are always delicious and cherries are in season now. I am going to make Russian dish very soon with sour cherries. Memories from my childhood. Nami, you really are becoming quite the baker! I love it! These bars look SO amazing, and we love browned butter in this house too. If only we had some cherry trees close enough for a day of picking (sigh). Yes, brown butter is so magical and your cake looks sooo delicious. I love how cherry adds special texture to the cake. Laura’s desserts are always so tempting aren’t they? These look amazing. I love it when you bake Nami! 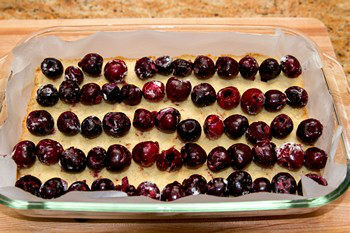 These bars looks yummy, I love to eat Cherry bars but not make them, because pitting the cherries is a chore. But I want to try these bars when our cherries come in – they look delicious. They look so GOOD, Nami! I’d have trouble stopping myself from having just two slices. We’ve been checking the cherries at our local grocery since last week. Unfortunately the price is still so high due to the late summer. Probably gotta wait for another week or two before we get to enjoy the sweet fruits. How fun to go cherry pickings with 5 families! That looks just perfect for my tea. it looks colorful and pretty! wanna try this next time I get cherries. Cherry bars look awesome! Love the deep hue they have attained after being baked. I have been wanting to make something with cherries ever since they hit the Indian market. Now, i know what to make! Thanks for sharing. What happened to the blogger who was nervous about baking? 😉 Look at all the beautiful and scrumptious things you’ve baked over the past year, Nami. These are gorgeous, and I have a weakness for cherry desserts. What a beautiful dessert! I love anything with cherry– I can imagine how it tastes. Nice post. OMG, This looks outstanding. My mouth is watering as I type. I remember Laura’s bars and your look equally delicious! I need to make these and right now I have a big bag of cherries in my fridge waiting for me to make something with them. Beautiful photos Nami. Have a wonderful week. They look absolutely delicious! I would so love to try some. I reckon I could easily polish off about 10 of them in one go. I love cherries so much: I grew up with a garden filled with tart and sweet cherry trees! Your photos here are so lovely! Pinned! You and Laura have both been killing me with these bars! I’m going to be forced to make them before cherry season is over…like really soon! They look wonderful, Nami…and as always, adore your step-by-step photos! Yay! So glad to hear you enjoyed it. True, next time I should eat with vanilla ice cream! 😀 Thank you so much for your feedback! 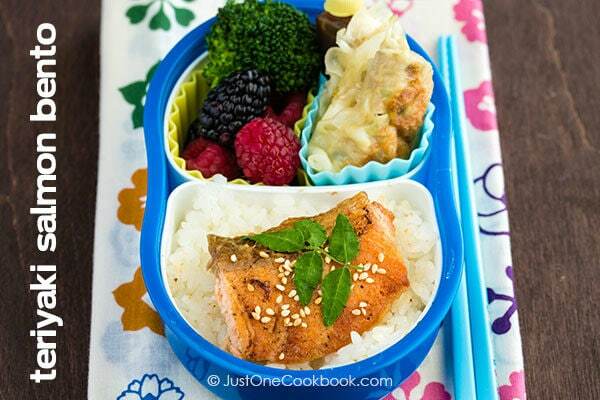 My daughter tried this recipe and everyone loved it! The almond adds such a nice touch to the cherries! We will be making this again! Would encourage any of your fans to try it. 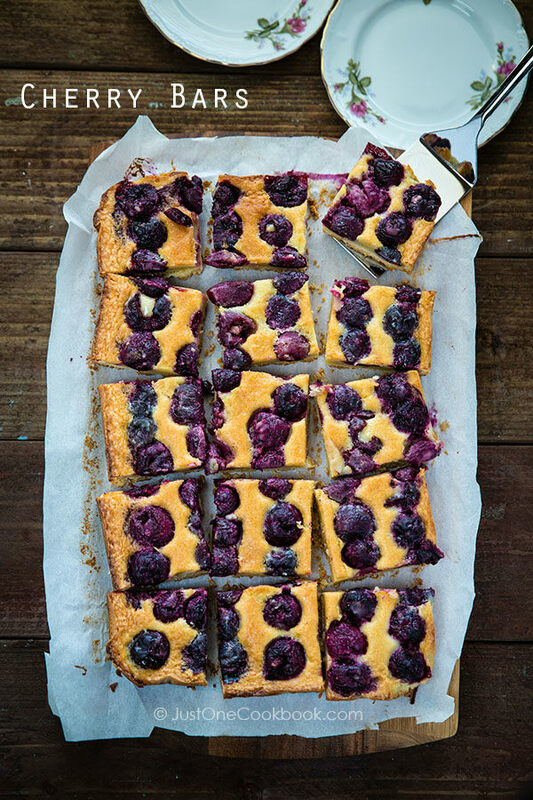 Nami, I made these bars yesterday using blueberries instead of cherries (and reduced the butter content a bit) and they were delicious. Thanks for he recipe! Very nice. Thank you and have a great weekend! Can you use frozen cherries? would that work too? Not a fresh cherry to be found in Massachusetts this time of year. Can i use this recipe with frozen cherries, well drained. Hi Beth! I think fresh cherry would work best, and I am afraid I am not too sure how frozen cherries would work in this recipe. In some baking recipes, frozen fruits are not recommended, but I’m not sure this could be the case. I hope it will be ok… but can’t guarantee… I’m sorry!